Received: September 12, 2017; Revised: October 17, 2017; Accepted: October 19, 2017; Published online: December 7, 2017. For more than half a century, cancer metabolism studies have focused on cell proliferation through anabolic pathways. Warburg described the major role of aerobic glycolysis in proliferating cancer cells converting glucose to lactate, generating biomass such as amino acids, fatty acid, and nucleotides (Warburg, 1956; Vander Heiden et al., 2010). Unlike in vitro, cancer cells in vivo are repeatedly subjected to resource-limited microenvironments of nutrition depletion, hypoxia and acidosis which induce in the cells a more quiescent, catabolic slow-life (slow proliferating cancer cells) stage which enables survival under metabolic stress (Ward and Thompson, 2012; Aktipis et al., 2013). Because the metabolic stress inevitably induces ROS-mediated oxidative stress, even under hypoxic condition (Chandel et al., 1997, Kang et al., 2015) nicotinamide adenine dinucleotide phosphate (NADPH) homeostasis is critical for cancer cell survival under starved microenvironment. It should be noted that current standard cancer therapeutics, such as chemotherapy and radiotherapy, also significantly induces oxidative stress in cancer cells, and antioxidant capacity provides therapeutic resistance in cancer cells (Ramanathan et al., 2005; Diehn et al., 2009; Decrock et al., 2017). While little is known about the metabolic pathways promoting NADPH homeostasis in cancer, emerging evidence reveals an important molecular network regulating metabolic flux into the pentose phosphate pathway for NADPH generation. Non-dividing normal differentiated cells mainly depend on mitochondrial oxidative phosphorylation to generate ATP (adenosine 5′-triphosphate). However, most human cancer cells metabolize the glucose through glycolysis (known as Warburg effect, for review glycolysis, see Vander Heiden et al., 2009), producing pyruvate and lactate as final metabolites in cells (Fig. 1). Although the glycolysis is inefficient in producing ATP, proliferating cancer cells under nourished condition utilize glucose in biomass production (such as amino acids, nucleotides, and fatty acids) to support new cells. Because the biologic aspects of glycolysis in proliferating fast-life of cancer cells are well-known, we mainly focused on the importance and regulatory network of PPP in supporting slow-life of cancer cells. The PPP (also known as the phosphogluconate pathway or the hexose monophosphate shunt) branched form glycolysis at the first committed step of glucose-6-phosphate (G-6-P) (Fig. 1). The PPP promotes the oxidative decarboxylation of G-6-P (oxidative PPP branch), yielding ribulose-5-phosphate (Ru-5-P). The Ru-5-P is isomerized into ribose-5-phosphate (R-5-P), which either serves as a nucleotide precursor or is metabolized through the non-oxidative PPP branch to produce fructose-6-phosphate (F-6-P) and glyceraldehyde-3-phosphate (G-3-P) via multiple enzymatic steps (for a detailed review of PPP, see Riganti et al., 2012 and Patra and Hay, 2014). Because F-6-P and G-3-P are also provided by the glycolytic process (Fig. 1), the NADPH from the oxidative phase is a unique biomolecule from PPP flux compared to glycolysis. The NADPH is essential for scavenging the reactive oxygen species (ROS) mainly derived from oxidative phosphorylation. In contrast, proliferating cells under nourished condition also have a high need for PPP activity to provide ribose-5-phosphate generating nucleotides and NADPH. The cancer cells in fast-life mainly consume NADPH during fatty acid synthesis (FAS) (Riganti et al., 2012). Thus, the regulatory network of PPP flux constitutes an important metabolic adaptation in various environmental contexts in human cancer. The glucose metabolism consists of highly interconnected pathways, and the key junctions between glycolysis and PPP being three important biomolecules: G-6-P, pyruvate, and acetyl CoA. Upon entering cells, glucose is rapidly phosphorylated to G-6-P by hexokinase (HK), and is subsequently metabolized toward glycolysis or the PPP. Although the PPP and glycolysis are divided from G-6-P, the metabolic circuit of both pathways is tightly connected, and a different flux mode is active depending on metabolic demands. The reversible nature of enzymes through allosteric regulation in the non-oxidative branch enables the PPP to engage glycolysis to adapt to the metabolic demands of cells (Fig. 1). The R-5-P, a product of oxidative PPP, is converted into G-3-P and F-6-P by transketolase (TKT) and transaldolase (TALDO1), creating a reversible metabolic link between PPP and glycolysis (Patra and Hay, 2014). 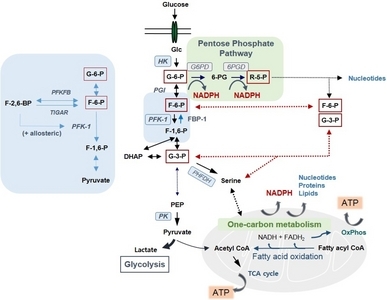 Diverse metabolic circuits between PPP and glycolysis depend on the fundamental metabolic need for NADPH, R-5-P, and ATP (Berg et al., 2010) (Fig. 2). When rapidly proliferating cells, such as cancer cells under nourished environment, require R-5-P rather than NADPH or ATP for the synthesis of nucleotide precursors supporting a fast-life (Mode I), F-6-P and G-3-P produced from glycolysis can enter the PPP via TKT and TALDO1. In this process, 5 moles of G-6-P are converted to 6 moles of R-5-P by consuming ATP. When the G-6-P enters the PPP directly, two moles of NADPH and one of R-5-P are generated from 1 mole of G-6-P in oxidative PPP (Mode II). When the cell needs a high level of NADPH rather than R-5-P, the NADPH is efficiently produced by interplay between PPP and glycolysis (Mode III). In this flux mode, the first step is the same as Mode II, wherein 6 moles of G-6-P can generate 12 moles of NADPH and 6 moles of R-5-P. These 6 moles of R-5-P are readily converted into 4 moles of F-6-P and 2 moles of G-3-P by TKT and TALDO1, and 5 moles of G-6-P are synthesized from both F-6-P and G-3-P via the gluconeogenic pathway. This flux, also known as recycling PPP, can completely oxidize G-6-P to CO2 with concomitant generation of NADPH. Although the flux amount can hardly be quantified in cells, the recycling PPP mode might be very important in cells requiring a high NADPH level, such as liver, fat tissue and neuron (Bouzier-Sore and Bolanos, 2015). This recycling flux mode should utilize gluconeogenesis, a reverse reaction of glycolysis, and FBP1 which converts F-1,6-BP to F-6-P as a rate-limiting enzyme in this flux. Note that PFK-1 and FBP1 interconvert F-6-P and F-1,6-P, representing rate-limiting bottlenecks of glycolysis and gluconeogenesis, respectively (discussed below in detail). Lastly, F-6-P and G-3-P derived from PPP can enter the glycolytic pathway to pyruvate (Mode IV). In this flux mode, NADPH and ATP are concomitantly generated, and the pyruvate can be oxidized to further generate ATP in mitochondria. Collectively, the PPP and glycolysis are tightly linked by bidirectional reactions of TKT and TALDO1, and the cancer cells utilize diverse flux modes depending on metabolic demand and the environmental situation. In nourished microenvironments, cancer cell proliferation is mediated via well-known aerobic glycolysis with an additional mitochondrial oxidative phosphorylation (Ox Phos) (Koppenol et al., 2011; Ward and Thompson, 2012). In this nourished condition, the cancer cell utilizes Mode I and Mode II of PPP flux, mainly to support anabolic metabolism. Distant metastasis comprises the most common cause of cancer mortality. It may therefore seem illogical to consider metastasis as inefficient. Nevertheless, clinical and experimental evidence suggests that the metastatic progression of cancer cells is indeed highly inefficient (Tarin et al., 1984; Luzzi et al., 1998; Chambers et al., 2002; Valastyan and Weinberg, 2011). Unlike hematopoietic cells, cancer cells arising from epithelial tissue (so-called carcinoma) should attach to the extracellular matrix, and matrix detachment leads to ATP deficiency and metabolic stress due to loss of glucose transport (Wong et al., 2001; Schafer et al., 2009). Conversely, matrix-detached and extravasated carcinoma cells must survive for successful metastatic progression. To do so, the cancer cells essentially require ATP, mainly derived from Ox Phos, NADH and NADPH, as a reducing power against oxidative stress (Cha et al., 2015). While oxidative phosphorylation mainly compensates ATP depletion in starved cells, it concurrently generates intracellular ROS. Intracellular ROS are mainly produced from mitochondrial activity in complex I (NADH dehydrogenase) and complex III (ubiquinone-cytochrome c reductase) of the electron transporter chain (Finkel and Holbrook, 2000). Under resource-limited conditions, increased mitochondrial Ox Phos and increased levels of intracellular ROS inhibit fatty acid oxidation (FAO) and ATP generation in a negative feedback loop (Riganti et al, 2012; Nogueira and Hay, 2013), impeding cell survival. A constant supply of reductive equivalents, specifically NADPH, for ROS detoxification is the key to maintaining metabolic homeostasis under stressful circumstances. Thus, cells under metabolic stressed condition, such as metastatic cancer cells, mainly use Modes III and IV flux of PPP to support catabolic metabolism. NADPH is the major electron donor in the reductive metabolic process. 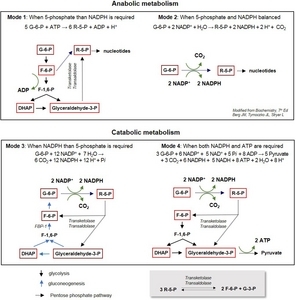 Although NADPH can be generated through several mechanisms, recent quantitative flux analysis indicates that NADPH is mainly provided by cytosolic oxidative PPP and mitochondrial serine-driven one-carbon metabolism entering in folate-methionine cycles (Locasale, 2013; Fan et al., 2014) (Fig. 1). The serine is biosynthesized from G-3-P dervied either from PPP and glycolysis, and is catalyzed by 3-phosphoglycerate dehydrogenase (PHGDH). Because the serine provides NADPH as well as amino acids, the importance of serine biosynthesis has recently emerged. Indeed, a small molecule inhibitor of PHGDH suppressed serine biosynthesis and in vivo tumor growth in PHGDH-dependent cells (Mullarky et al., 2016; Pacold et al., 2016). While the serine derived from G-3-P generate 30–40% of NADPH under nourished environment, it should be noted that FAS and DNA synthesis in proliferating cells consume most of the NADPH (Fan et al., 2014). In starved condition with shutdown of glucose uptake, the role of serine-driven NADPH biosynthesis and ATP generation is still unclear and further study is required in terms of cell survival during cancer progression. In this review, we mainly focus on flux control towards PPP by environmental cues and ongogenic mutation in cancer cells. The glucose entering the PPP may vary from 5–30%, depending on tissue (Riganti et al., 2012). With enough glucose in non-dividing cells under normal physiologic condition, NADPH is mostly consumed during FAS. Therefore, high PPP flux is reached in liver, adipose tissue, lactating mammary glands, adrenal glands, and red blood cells (Cabezas et al., 1999; Riganti et al., 2012). The basal rate of the PPP, a major source of NADPH, mainly depends on the NADP+/NADPH ratio; moreover, the G6PD enzyme is highly specific for NADP+. Recently, metabolic regulation of PPP flux in human disease has gained significant attention due to the metabolic pathway’s function against oxidative stress. As noted earlier, matrix detachment of solid tumor cells induces ATP deficiency accompanied by increased ROS level due to the loss of glucose uptake. In this metabolic stress condition, the ERBB2 oncogene rescues the ATP depletion depending on glucose flux into PPP (Schafer et al., 2009) although the mechanistic link between ERBB2 and PPP is still unclear. There are several regulatory mechanisms involved in the flux control between glycolysis and PPP, including reciprocal interactions. First, PPP flux can be controlled by the glycolytic pathway. When the glycolytic pathway is inhibited, glucose re-flux towards the PPP is increased. Second, phosphofructokinase-1 (PFK-1) and pyruvate kinase (PK) convert irreversible enzymatic steps in glycolytic reactions. These enzymatic steps serve as important control sites of glycolytic flux via reversible allosteric control, post-translational modification (such as phosphorylation and O-glycosylation), and transcriptional regulation (Fig. 3). 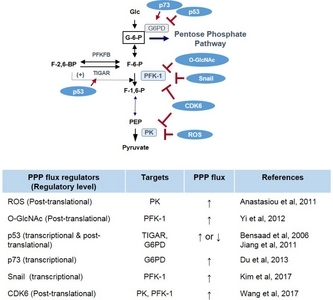 Therefore, genetic alterations in cancer and metabolic cues controlling glucose flux between PPP and glycolysis involve enzymatic steps catalyzed by (1) G6PD as a gatekeeper of PPP flux, and (2) PFK-1 and PK as a rate-limiting step of glycolysis (Fig. 3). PFK-1 is the most important control site in mammalian glycolysis as a first rate-limiting step, the kinase activity being inhibited by ATP level in a negative feedback loop. Compared to G6PD and PK, the regulatory mechanism of PFK-1 is complex due to the presence of fructose 2,6-bisphosphate (F-2,6-BP), which forms in a reaction catalyzed by PFK-2, which acts as a potent activator of PFK-1 by increasing the affinity of PFK-1 to F-6-P and decreasing the inhibitory effect of ATP (Fig. 3). PFK-2 is a bi-functional enzyme that catalyzes the synthesis of F-2,6-BP from F-6-P with the N-terminal kinase domain and also catalyzes the reverse hydrolysis reaction with the C-terminal phosphatase domain (for a review of PFK-2, see Ros and Schulze, 2013). There are several PFK-2 isoenzymes in mammals, PFKFB1 to PFKFB4. Increased levels of F-2,6-BP allow cancer cells to maintain a high glycolytic activity independent of ATP levels (Berg et al, 2010). Therefore, F-2,6-BP level can be controlled by pharmacologic inhibition of N-terminal kinase activity on PFKBPs. Indeed, a small molecule inhibitor of PFKFB3, 3-(3-pyridinyl)-1-(4-pyridinyl)-2-propen-1-one (3PO), suppressed glycolytic metabolites such as lactate, ATP, and NADH while also attenuating the proliferation of cancer cells (Clem et al., 2008); the effect of 3PO on PPP flux is not yet known. Interestingly, PFKFB4 was identified as a therapeutic target of cancer, especially in prostate cancer (Ros et al., 2012). Knockdown of PFKFB4 leads to a significant increase in F-2,6-BP in cancer cells followed by decreasing NADPH level and increasing ROS with cancer cell death. As a well-known tumor suppressor in human cancer, p53 is involved in PFK-1 activity via transcriptional upregulation of TIGAR (TP53-induced glycolysis and apoptosis regulator) (Bensaad et al., 2006). Because the TIGAR possesses only the bisphosphatase active site lacking N-terminal kinase domain of PFKFB, it degrades F-2,6-BP cellular levels and thus inhibits PFK-1 activity and glycolysis (Li and Jogl, 2009; Mor et al., 2011). The inhibition of glycolysis by TIGAR increases PPP flux and NADPH levels with enhanced ability to regulate cellular ROS level and oxidative stress (Bensaad et al., 2006; Cheung et al., 2012; Ko et al., 2016). While the role of TIGAR in PPP flux is clear, it should be noted that p53 is involved in various levels of metabolic PPP circuitry other than TIGAR (for the effect of p53 on metabolism, see Kruiswijk et al., 2015). As a gate-keeper of glycolysis, the PFK-1 constitutes an important control step regulating glucose flux between PPP and glycolysis. PFK-1 in mammal is encoded by three genes: PFKL and PFKM, expressed in liver and muscle respectively, and PFKP, mainly expressed in platelet, each encoding a different isoform. In human cancer, the PFKP isoform prevails over PFKM or PFKL and is a major controlling step of aerobic glycolysis in human cancer (Kim et al., 2017). Post-translational O-GlcNAcylation on Ser residue of PFK-1 in response to hypoxia inhibits its kinase activity and redirects glucose flux towards the PPP, conferring a selective advantage against oxidative stress on cancer cells (Yi et al., 2012). Recently, cyclin D3-CDK6 complex has been found to phosphorylate and inhibit the PFKP in cancer (Wang et al., 2017). This inhibition of PFKP by CDK6 also redirects glucose flux into the PPP, providing a pro-survival function under metabolic stress. Snail, a key regulator of cancer EMT, suppresses glycolysis by transcriptional repression of PFKP and regulates glucose flux toward PPP, allowing cancer cell survival under metabolic stress condition similarly to CDK6 (Kim et al., 2017). Knockdown of PFKP significantly suppressed glycolytic flux with G0/G1 cell cycle arrest and ceased cell proliferation. However, suppression of PFKP significantly increased cancer cell survival under metabolic starved condition by increasing PPP flux and NADPH generation. Cancer cells in which endogenous PFKP was dynamically knockdowned exhibited increases resistance to oxidative stress as well as metastatic potential in vivo (Kim et al., 2017). Thus, suppression of PFKP during EMT provides cell survival advantage via Mode III flux. Note that FBP1, which catalyzes the reverse reaction of PFKP and constitutes a gatekeeper of gluconeogenesis, is also down-regulated in many types of human cancer (Dong et al., 2013; Li et al., 2014; Zhang et al., 2016). Interestingly, Snail or ZEB1 EMT inducer also suppresses FBP1 expression, and restoring FBP1 in cancer cells inhibits invasion and tumorigenic potential. Paradoxically, loss of FBP1 decreases cellular ROS level similarly to suppression of FPKP. Although whether and how FBP1 controls flux into PPP remains unclear, the loss of FBP1 in cancer allows high glycolytic flux under nourished environment and may provide survival advantage with Mode IV flux under starved condition by generating NADPH and ATP together. Therefore, as rate-limiting steps of glycolysis and gluconeogenesis, the bidirectional suppression of PFKP and FBP1 by Snail repressor may play important role in regulating flux control in response to metabolic demands of cancer cells. PK, the enzyme catalyzing the last irreversible step in glycolysis, also controls the glucose flux of glycolysis. In mammals, several isoforms of PK are encoded by different genes: L type in liver and the M type in muscle and brain. In human cancer, the M2 isoform of PK (PKM2) is exclusively expressed similarly to PFKP, and the PKM2 is phosphorylated by tyrosine kinase, resulting in inhibition of PKM2 kinase activity (Christofk et al., 2008a, 2008b). Interestingly, intracellular ROS and CDK6 directly inhibit PKM2 activity via oxidation and phosphorylation, respectively (Anastasiou et al., 2011; Wang et al., 2017). The inhibition of PKM2 by ROS or CDK6 suppresses glycolytic flux together with increased PPP flux and NADPH generation, providing a survival advantage to cancer cells (Fig. 3). The PPP comprises two phases: the oxidative and the nonoxidative branches. Glucose-6-phosphate dehydrogenase (G6PD) generates NADPH in the oxidative PPP by oxidizing G-6-P to 6-phosphogluconolacton (6-PG). A second NADPH and CO2 are generated downstream via oxidative decarboxylation of 6-phosphogluconic acid by 6-phosphogluconic dehydrogenase (6PGD), the last step of the oxidative branch producing ribulose/ribose-5-phosphate (R-5-P) (Riganti et al., 2012; Stanton, 2012). The nonoxidatvie branch comprises a series of reversible reactions by the allosteric enzymes to adapt to the metabolic demands of cells. As noted earlier, F-6-P and G-3-P can pass in either direction between the nonoxidative PPP branch and the glycolytic pathway (Fig. 1). Therefore, G6PD is the first committed enzyme for NADPH generation in the oxidative PPP branch; we only focus on the PPP oxidative branch, which maintains the redox balance in cancer cells. Not surprisingly, cancer cells exhibit higher expression of G6PD than normal tissue (Bokun et al., 1987; Wang, Yuan et al. 2012). Several oncogenic signals are associated with PPP flux regulation through G6PD. The cytoplasmic p53 tumor suppressor directly interacts with G6PD and inhibits its activity, resulting in a decreasing both PPP flux and NADPH generation (Jiang et al., 2011). This observation merits special attention in terms of the role of p53 on PPP flux because p53’s downstream target TIGAR increased the PPP flux, as noted earlier (Bensaad et al., 2006; Li and Jogl, 2009; Mor et al., 2011). The p53 also suppresses Snail via post-transcriptional regulation of miRNA-34 (Kim et al., 2011). Therefore, the role of p53 tumor suppressor and its downstream targets in human cancer require further study in terms of metabolic flux into glycolysis and PPP. Another member of the p53 family, p73, increases PPP flux and NADPH production via transcriptional activation of G6PD (Du et al., 2013). An earlier study revealed that epidermal growth factor (EGF) or platelet-derived growth factor (PDGF) increase G6PD activity, while the mechanistic link between receptor tyrosine kinase and G6PD is not well understood (Stanton et al., 1991). These observations indicate that G6PD is a key controller of PPP flux regulated by many oncogenes, and further investigation is required into G6PD regulation by oncogenes providing proliferation and survival advantage of cancer cells. Emerging evidence suggests that G6PD, a gatekeeper of PPP, is a potential therapeutic target of human cancer. Prior to discussing it as a cancer target, we should note the extensive epidemiological background of G6PD deficiency, the most common human genetic alteration, which has been studied for the past 90 years. The PPP was first described in the 1920s, when the introduction of new antimalarial drugs such as primaquine led to drug-induced hemolytic anemia (cited from Riganti et al., 2012). Subsequently, it was revealed that individuals with primaquine-sensitive hemolysis and lowered reduced-form of GSH were G6PD-deficient (Carson et al., 1956). In red blood cells lacking mitochondria as well as nucleus, the PPP is the exclusive route for NADPH production. Therefore, attenuated PPP due to G6PD deficiency renders red blood cells more vulnerable to drug-induced oxidative stress. G6PD-encoding genes map at the telomeric region of the distal long arm of the X chromosome (Xq28 locus). G6PD deficiency is the most common genetic mutation in the world, estimated to occur in at least 400 million people worldwide (Nkhoma et al., 2009). WHO has classified about 300 variants into several classes according to mutant enzymatic activity. Most G6PD deficiencies are class II, having less than 10% activity compared to wild type, although the majority of individuals remain asymptomatic until they are exposed to certain drugs (Stanton, 2012). These suggest that mitochondrial one-carbon metabolism may compensate NADPH during the developmental process and normal life although the contribution of the one-carbon metabolism to NADPH homeostasis in G6PD-deficient individuals is still unknown. Due to the pivotal role of G6PD in PPP flux and cellular redox balance, there is an interesting epidemiological hypothesis that G6PD deficiency is inversely correlated to cancer incidence and mortality. While lower cancer prevalence in G6PD-deficient individuals was reported from a large epidemiological study conducted in 1980s, the results were inconclusive (Cocco et al., 1987). Cancer mortality from all cancer was lower in G6PD-deficient individuals compared to wild-type phenotype (Cocco et al., 1996). Recently, a large reduction in colorectal cancer risk among G6PD-deficient individuals was reported in a long-term cohort study of sub-Saharian Africa (Dore et al., 2016). This epidemiological evidence provides important insights for a G6PD therapeutic stategy for human cancer. First, G6PD abundance is increased in many types of human cancer. Furthermore, active oxidative PPP is observed in tumors with multidrug resistance in preexisting chemotherapeutics (Riganti et al., 2012). Thus, PPP inhibition may serve as a therapeutic target based on the lower risk of cancer in the G6PD-deficient population. Second, most asymptomatic G6PD-deficient individuals have less than 10% enzymatic activity compared to wild type G6PD. In experimental settings, embryonic stem cells with complete G6PD deletion proliferate normally but are susceptible to oxidative stress (Pandolfi et al., 1995; Paglialunga et al., 2004). These observations suggest an interesting aspect of PPP inhibition in that a specific inhibitor of G6PD or 6-PGD can be less toxic in normal cells compared to conventional cytotoxic therapeutics. Indeed, a specific inhibitor of 6-PGD effectively attenuates tumor growth in vivo without obvious toxicity (Lin et al., 2015). However, PPP inhibition alone has limited therapeutic potential because it inevitably increases NADP+, a potent activator of G6PD. There are many G6PD inhibitors (Singh et al., 2012; Preuss et al., 2013), one of interest being dehydroepiandrosterone (DHEA). DHEA is one of the most abundant circulating endogenous steroids in human, produced from the adrenal gland and gonads during cholesterol metabolism. As an uncompetitive inhibitor of G6PD, DHEA is also used orally as a dietary supplement (Fig. 4A) (Gordon et al., 1995). DHEA has very low toxicity in human, daily doses up to 1.6 g taken orally for one month being well tolerated. As mentioned earlier, the Snail/PFKP axis increased PPP flux and NADPH levels in a G6PD-dependent manner and DHEA treatment reversed NADPH homeostasis induced by Snail repressor (Fig. 4B). Since the suppression of PFKP leads to PPP reflux, dynamic knockdown of PFKP significantly increases cancer cell survival under glucose starved condition and DHEA largely attenuates breast cancer cell survival as determined by clonogenic capacity (Fig. 4C). The antioxidative capacity is also closely related to chemotherapeutic resistance to paclitaxel, one of the most commonly used therapeutics for human cancer (Ramanathan et al., 2005). Indeed, DHEA enhances the therapeutic potential of paclitaxel on MDA-MB-231 breast cancer cells (Fig. 4D). While DHEA clearly inhibits PPP flux and NADPH production in vitro (Tian et al., 1998; Schafer et al., 2009), its anti-cancer effect in vivo has not been thoroughly studied. Note that lowered ROS levels are critically required for radioresistance in cancer stem cells (Diehn et al., 2009); however, the role of PPP in radiation-induced cancer cell death is also needs further research. Based on epidemiological evidence of G6PD deficiency and metabolic charateristics of PPP in human cancer, we propose G6PD as a potential target of a synthetic lethal therapeutic approach for human cancer combined with coventional cytotoxic or targeted therapeutics. Other metabolic targets, such as aldehyde dehydrogenase (ALDH), mitochondrial metabolism, glutamine metabolism and fatty acid oxidation, also hold promise for use in combinatory theraputics to inhibit G6PD in cancer (Kim, 2015). Further study of oncongenic function on PPP flux and for development of specific inhibitor of G6PD might provide new insights to clinical benefit of cancer treatment. Cancer cells adapt their metabolic circuitry to support proliferation under nourished fast-life as well as to survive under starved slow-life. Emerging evidence suggests that PPP flux is increased in human cancer and that the PPP plays an important role in cancer progression although the oncogenic regulation of PPP is not fully understood yet. During the natural history of cancer initiation and progression, cancer cells are inevitably and repeatedly exposed to a metabolic starved environment. Under starved condition, the ATP and NADPH are essential to the slow-life of cancer cells. The ATP is generated by the oxidation (mainly from oxidative phosphorylation in mitochondria) of many molecules such as glucose, fatty acids, and amino acids. NADPH mainly generated from PPP is the major electron donor in reductive biosynthesis supporting the oxidation process. As discussed earlier, cancer cells have acquired mechanisms to activate PPP based on metabolic demand. Further studies will uncover additional mechanisms by which cancer cells utilize the PPP to support their survival and proliferation. Also, more work is needed to find a novel and specific therapeutics for hyperactive PPP in human cancer. We thank E. Tunkle for preparation of the manuscript. This work was supported by grants from the National Research Foundation of Korea (NRF-2016R1E1A1A01942724, NRF-2017R1A2B3002241, NRF-2017R1C1B1012464, NRF-2017M3A9G2074773) funded by the Korea government (MSIP) and a grant from the National Research Foundation of Korea (NRF-2014R1A6A3A04055110) funded by the Korea government (MOE). Fig. 1. The glycolysis and pentose phosphate pathways (PPP) are tightly connected. The glucose entering the in cell membrane is rapidly phosphorylated by HK and converted to G-6-P. The G-6-P is metabolized either by the glycolytic pathway, generating pyruvate and lactate, or by PPP to produce NADPH. The F-6-P and G-3-P generated from the non-oxidative branch of PPP can enter glycolysis or gluconeogenesis. The NADPH is generated from oxidative PPP in cytosolic space and serine-driven one carbon metabolism in mitochondria. Arrows indicate irreversible enzymatic steps, and bi-directional arrows indicate interconverting reversible reactions determined by substrate concentration. Inset (left) shows the feed-forward regulatory loop of PFK-1 as a rate-limiting step of glycolytic flux. G-6-P: glucose-6-phosphate, F-6-P: fructose-6-phosphate, F-1,6-P: fructose1,6-bisphosphate, F-2,6-BP: fructose2,6-bisphosphate, G-3-P: glyceraldehyde-3-phosphate, PEP: phosphoenolpyruvate, 6-PG: 6-phosphoglucolactone, R-5-P: Ribose-5-phosphate, HK: Hexokinase, PGI: phosphoglucose isomerase, PFK-1: phophofructokinase-1, FBP-1: fructose-1,6-bisphosphatase, PK: pyruvate kinase, G6PD: glucose-6-phosphate dehydrogenase, 6-PGD: 6-phosphogluconate dehydrogenase, PFKFB: 6-phosphofructo-2-kiase/fructose-2,6-biphosphatase, TIGAR: TP53-induced glycolysis and apoptosis regulator. Fig. 2. Diverse flux modes interconnecting glycolysis and PPP in different metabolic situations (modified from ). Major metabolites are shown in red box and the stoichiometry of each mode is denoted. The PPP and glycolysis are reversibly linked by bi-directional transketolase (TKT) and transaldolase (TALDO1), as shown below. Fig. 3. Oncogenic regulation of glucose flux into PPP. Fig. 4. The DHEA, an uncompetitive inhibitor of G6PD, regulated NADPH level and cancer cell survival under metabolic stress. (A) Chemical structure of DHEA. (B) Snail increased NADPH levels and siRNA-mediated or DHEA treatment reverted anti-oxidant level in MCF-7 and MDA-MB-231 cells. (C) Clonogenic survival assay of cancer cells following glucose starvation for 72 h. Knockdown of PFKP increased cell survival under glucose starvation and DHEA (20 μg/ml) treatment reversed the effects of PFKP knockdown. (D) Clonogenic survival of MDA-MB-231 cells against paclitaxel treatment as indicated by concentration. The DHEA and paclitaxel were treated for a 48 h period, and clonogenic capacity was determined. Statistical significances compared with each control are denoted as **p<0.01. See for the experimental procedures for NADPH and clononogenic assay. Aktipis, CA, Boddy, AM, Gatenby, RA, Brown, JS, and Maley, CC (2013). Life history trade-offs in cancer evolution.. Nat Rev Cancer. 13, 883-892. Anastasiou, D, Poulogiannis, G, Asara, JM, Boxer, MB, Jiang, J-K, Shen, M, Bellinger, G, Sasaki, AT, Locasale, JW, Auld, DS, Thomas, CJ, Vander Heiden, MG, and Cantley, LC (2011). Inhibition of pyruvate kinase M2 by reactive oxygen species contributes to cellular antioxidant responses.. Science. 334, 1278-1283. Bensaad, K, Tsuruta, A, Selak, MA, Vidal, MN, Nakano, K, Bartrons, R, Gottlieb, E, and Vousden, KH (2006). TIGAR, a p53-inducible regulator of glycolysis and apoptosis.. Cell. 126, 107-120. Bokun, R, Bakotin, J, and Milasinovic, D (1987). Semiquantitative cytochemical estimation of glucose-6-phosphate dehydrogenase activity in benign diseases and carcinoma of the breast.. Acta Cytol. 31, 249-252. Bouzier-Sore, AK, and Bolanos, JP (2015). Uncertainties in pentose-phosphate pathway flux assessment underestimate its contribution to neuronal glucose consumption: relevance for neurodegeneration and aging.. Front Aging Neurosci. 7, 89. Cabezas, H, Raposo, RR, and Melendez-Hevia, E (1999). Activity and metabolic roles of the pentose phosphate cycle in several rat tissues.. Mol Cell Biochem. 201, 57-63. Carson, PE, Flanagan, CL, Ickes, CE, and Alving, AS (1956). Enzymatic deficiency in primaquine-sensitive erythrocytes.. Science. 124, 484-485. Cha, YH, Yook, JI, Kim, HS, and Kim, NH (2015). Catabolic metabolism during cancer EMT.. Arch Pharm Res. 38, 313-320. Chambers, AF, Groom, AC, and MacDonald, IC (2002). Dissemination and growth of cancer cells in metastatic sites.. Nat Rev Cancer. 2, 563-572. Chandel, NS, Budinger, GR, Choe, SH, and Schumacker, PT (1997). Cellular respiration during hypoxia. Role of cytochrome oxidase as the oxygen sensor in hepatocytes.. J Biol Chem. 272, 18808-18816. Cheung, EC, Ludwig, RL, and Vousden, KH (2012). Mitochondrial localization of TIGAR under hypoxia stimulates HK2 and lowers ROS and cell death.. Proc Natl Acad Sci USA. 109, 20491-20496. Christofk, HR, Vander Heiden, MG, Harris, MH, Ramanathan, A, Gerszten, RE, Wei, R, Fleming, MD, Schreiber, SL, and Cantley, LC (2008a). The M2 splice isoform of pyruvate kinase is important for cancer metabolism and tumour growth.. Nature. 452, 230-233. Christofk, HR, Vander Heiden, MG, Wu, N, Asara, JM, and Cantley, LC (2008b). Pyruvate kinase M2 is a phosphotyrosine-binding protein.. Nature. 452, 181-186. Clem, B, Telang, S, Clem, A, Yalcin, A, Meier, J, Simmons, A, Rasku, MA, Arumugam, S, Dean, WL, Eaton, J, Lane, A, Trent, JO, and Chesney, J (2008). Small-molecule inhibition of 6-phosphofructo-2-kinase activity suppresses glycolytic flux and tumor growth.. Mol Cancer Ther. 7, 110-120. Cocco, P, Carta, P, Flore, C, Congia, P, Manca, MB, Saba, G, and Salis, S (1996). Mortality of lead smelter workers with the glucose-6-phosphate dehydrogenase-deficient phenotype.. Cancer Epidemiol Biomarkers Prev. 5, 223-225. Cocco, P, Manca, P, and Dessi, S (1987). Preliminary results of a geographic correlation study on G6PD deficiency and cancer.. Toxicol Pathol. 15, 106-108. Decrock, E, Hoorelbeke, D, Ramadan, R, Delvaeye, T, De Bock, M, Wang, N, Krysko, DV, Baatout, S, Bultynck, G, Aerts, A, Vinken, M, and Leybaert, L (2017). Calcium, oxidative stress and connexin channels, a harmonious orchestra directing the response to radiotherapy treatment?. Biochim Biophys Acta. 1864, 1099-1120. Diehn, M, Cho, RW, Lobo, NA, Kalisky, T, Dorie, MJ, Kulp, AN, Qian, D, Lam, JS, Ailles, LE, Wong, M, Joshua, B, Kaplan, MJ, Wapnir, I, Dirbas, FM, Somlo, G, Garberoglio, C, Paz, B, Shen, J, Lau, SK, Quake, SR, Brown, JM, Weissman, IL, and Clarke, MF (2009). Association of reactive oxygen species levels and radioresistance in cancer stem cells.. Nature. 458, 780-783. Dong, C, Yuan, T, Wu, Y, Wang, Y, Fan, TW, Miriyala, S, Lin, Y, Yao, J, Shi, J, Kang, T, Lorkiewicz, P, St Clair, D, Hung, MC, Evers, BM, and Zhou, BP (2013). Loss of FBP1 by Snail-mediated repression provides metabolic advantages in basal-like breast cancer.. Cancer Cell. 23, 316-331. Dore, MP, Davoli, A, Longo, N, Marras, G, and Pes, GM (2016). Glucose-6-phosphate dehydrogenase deficiency and risk of colorectal cancer in Northern Sardinia: A retrospective observational study.. Medicine (Baltimore). 95, e5254. Du, W, Jiang, P, Mancuso, A, Stonestrom, A, Brewer, MD, Minn, AJ, Mak, TW, Wu, M, and Yang, X (2013). TAp73 enhances the pentose phosphate pathway and supports cell proliferation.. Nat Cell Biol. 15, 991-1000. Fan, J, Ye, J, Kamphorst, JJ, Shlomi, T, Thompson, CB, and Rabinowitz, JD (2014). Quantitative flux analysis reveals folate-dependent NADPH production.. Nature. 510, 298-302. Finkel, T, and Holbrook, NJ (2000). Oxidants, oxidative stress and the biology of ageing.. Nature. 408, 239-247. Gordon, G, Mackow, MC, and Levy, HR (1995). On the mechanism of interaction of steroids with human glucose 6-phosphate dehydrogenase.. Arch Biochem Biophys. 318, 25-29. Jiang, P, Du, W, Wang, X, Mancuso, A, Gao, X, Wu, M, and Yang, X (2011). p53 regulates biosynthesis through direct inactivation of glucose-6-phosphate dehydrogenase.. Nat Cell Biol. 13, 310-316. Kang, SW, Lee, S, and Lee, EK (2015). ROS and energy metabolism in cancer cells: alliance for fast growth.. Arch Pharm Res. 38, 338-345. Kim, NH, Cha, YH, Lee, J, Lee, SH, Yang, JH, Yun, JS, Cho, ES, Zhang, X, Nam, M, Kim, N, Yuk, YS, Cha, SY, Lee, Y, Ryu, JK, Park, S, Cheong, JH, Kang, SW, Kim, SY, Hwang, GS, Yook, JI, and Kim, HS (2017). Snail reprograms glucose metabolism by repressing phosphofructokinase PFKP allowing cancer cell survival under metabolic stress.. Nat Commun. 8, 14374. Kim, NH, Kim, HS, Li, XY, Lee, I, Choi, HS, Kang, SE, Cha, SY, Ryu, JK, Yoon, D, Fearon, ER, Rowe, RG, Lee, S, Maher, CA, Weiss, SJ, and Yook, JI (2011). A p53/miRNA-34 axis regulates Snail1-dependent cancer cell epithelial-mesenchymal transition.. J Cell Biol. 195, 417-433. Kim, SY (2015). Cancer metabolism: targeting cancer universality.. Arch Pharm Res. 38, 299-301. Ko, YH, Domingo-Vidal, M, Roche, M, Lin, Z, Whitaker-Menezes, D, Seifert, E, Capparelli, C, Tuluc, M, Birbe, RC, Tassone, P, Curry, JM, Navarro-Sabate, A, Manzano, A, Bartrons, R, Caro, J, and Martinez-Outschoorn, U (2016). TP53-inducible Glycolysis and Apoptosis Regulator (TIGAR) Metabolically reprograms carcinoma and stromal cells in breast cancer.. J Biol Chem. 291, 26291-26303. Kruiswijk, F, Labuschagne, CF, and Vousden, KH (2015). p53 in survival, death and metabolic health: a lifeguard with a licence to kill.. Nat Rev Mol Cell Biol. 16, 393-405. Li, B, Qiu, B, Lee, DS, Walton, ZE, Ochocki, JD, Mathew, LK, Mancuso, A, Gade, TP, Keith, B, Nissim, I, and Simon, MC (2014). Fructose-1,6-bisphosphatase opposes renal carcinoma progression.. Nature. 513, 251-255. Li, H, and Jogl, G (2009). Structural and biochemical studies of TIGAR (TP53-induced glycolysis and apoptosis regulator).. J Biol Chem. 284, 1748-1754. Lin, R, Elf, S, Shan, C, Kang, HB, Ji, Q, Zhou, L, Hitosugi, T, Zhang, L, Zhang, S, Seo, JH, Xie, J, Tucker, M, Gu, TL, Sudderth, J, Jiang, L, Mitsche, M, DeBerardinis, RJ, Wu, S, Li, Y, Mao, H, Chen, PR, Wang, D, Chen, GZ, Hurwitz, SJ, Lonial, S, Arellano, ML, Khoury, HJ, Khuri, FR, Lee, BH, Lei, Q, Brat, DJ, Ye, K, Boggon, TJ, He, C, Kang, S, Fan, J, and Chen, J (2015). 6-Phosphogluconate dehydrogenase links oxidative PPP, lipogenesis and tumour growth by inhibiting LKB1-AMPK signalling.. Nat Cell Biol. 17, 1484-1496. Locasale, JW (2013). Serine, glycine and one-carbon units: cancer metabolism in full circle.. Nat Rev Cancer. 13, 572-583. Luzzi, KJ, MacDonald, IC, Schmidt, EE, Kerkvliet, N, Morris, VL, Chambers, AF, and Groom, AC (1998). Multistep nature of metastatic inefficiency: dormancy of solitary cells after successful extravasation and limited survival of early micrometastases.. Am J Pathol. 153, 865-873. Mor, I, Cheung, EC, and Vousden, KH (2011). Control of glycolysis through regulation of PFK1: old friends and recent additions.. Cold Spring Harb Symp Quant Biol. 76, 211-216. Mullarky, E, Lucki, NC, Beheshti Zavareh, R, Anglin, JL, Gomes, AP, Nicolay, BN, Wong, JC, Christen, S, Takahashi, H, Singh, PK, Blenis, J, Warren, JD, Fendt, SM, Asara, JM, DeNicola, GM, Lyssiotis, CA, Lairson, LL, and Cantley, LC (2016). Identification of a small molecule inhibitor of 3-phosphoglycerate dehydrogenase to target serine biosynthesis in cancers.. Proc Natl Acad Sci USA. 113, 1778-1783. Nkhoma, ET, Poole, C, Vannappagari, V, Hall, SA, and Beutler, E (2009). The global prevalence of glucose-6-phosphate dehydrogenase deficiency: a systematic review and meta-analysis.. Blood Cells Mol Dis. 42, 267-278. Nogueira, V, and Hay, N (2013). Molecular pathways: reactive oxygen species homeostasis in cancer cells and implications for cancer therapy.. Clin Cancer Res. 19, 4309-4314. Pacold, ME, Brimacombe, KR, Chan, SH, Rohde, JM, Lewis, CA, Swier, LJ, Possemato, R, Chen, WW, Sullivan, LB, Fiske, BP, Cho, S, Freinkman, E, Birsoy, K, Abu-Remaileh, M, Shaul, YD, Liu, CM, Zhou, M, Koh, MJ, Chung, H, Davidson, SM, Luengo, A, Wang, AQ, Xu, X, Yasgar, A, Liu, L, Rai, G, Westover, KD, Vander Heiden, MG, Shen, M, Gray, NS, Boxer, MB, and Sabatini, DM (2016). A PHGDH inhibitor reveals coordination of serine synthesis and one-carbon unit fate.. Nat Chem Biol. 12, 452-458. Paglialunga, F, Fico, A, Iaccarino, I, Notaro, R, Luzzatto, L, Martini, G, and Filosa, S (2004). G6PD is indispensable for erythropoiesis after the embryonic-adult hemoglobin switch.. Blood. 104, 3148-3152. Pandolfi, PP, Sonati, F, Rivi, R, Mason, P, Grosveld, F, and Luzzatto, L (1995). Targeted disruption of the housekeeping gene encoding glucose 6-phosphate dehydrogenase (G6PD): G6PD is dispensable for pentose synthesis but essential for defense against oxidative stress.. EMBO J. 14, 5209-5215. Patra, KC, and Hay, N (2014). The pentose phosphate pathway and cancer.. Trends Biochem Sci. 39, 347-354. Preuss, J, Richardson, AD, Pinkerton, A, Hedrick, M, Sergienko, E, Rahlfs, S, Becker, K, and Bode, L (2013). Identification and characterization of novel human glucose-6-phosphate dehydrogenase inhibitors.. J Biomol Screen. 18, 286-297. Ramanathan, B, Jan, KY, Chen, CH, Hour, TC, Yu, HJ, and Pu, YS (2005). Resistance to paclitaxel is proportional to cellular total antioxidant capacity.. Cancer Res. 65, 8455-8460. Riganti, C, Gazzano, E, Polimeni, M, Aldieri, E, and Ghigo, D (2012). The pentose phosphate pathway: an antioxidant defense and a crossroad in tumor cell fate.. Free Radic Biol Med. 53, 421-436. Ros, S, Santos, CR, Moco, S, Baenke, F, Kelly, G, Howell, M, Zamboni, N, and Schulze, A (2012). Functional metabolic screen identifies 6-phosphofructo-2-kinase/fructose-2,6-biphosphatase 4 as an important regulator of prostate cancer cell survival.. Cancer Discov. 2, 328-343. Ros, S, and Schulze, A (2013). Balancing glycolytic flux: the role of 6-phosphofructo-2-kinase/fructose 2,6-bisphosphatases in cancer metabolism.. Cancer Metab. 1, 8. Schafer, ZT, Grassian, AR, Song, L, Jiang, Z, Gerhart-Hines, Z, Irie, HY, Gao, S, Puigserver, P, and Brugge, JS (2009). Antioxidant and oncogene rescue of metabolic defects caused by loss of matrix attachment.. Nature. 461, 109-113. Singh, S, An, A, and Srivastava, PK (2012). Regulation and properties of glucose-6-phosphate dehydrogenase: a review.. Int J Plant Physiol Biochem. 4, 1-19. Stanton, RC (2012). Glucose-6-phosphate dehydrogenase, NADPH, and cell survival.. IUBMB Life. 64, 362-369. Stanton, RC, Seifter, JL, Boxer, DC, Zimmerman, E, and Cantley, LC (1991). Rapid release of bound glucose-6-phosphate dehydrogenase by growth factors. Correlation with increased enzymatic activity.. J Biol Chem. 266, 12442-12448. Tarin, D, Price, JE, Kettlewell, MG, Souter, RG, Vass, AC, and Crossley, B (1984). Mechanisms of human tumor metastasis studied in patients with peritoneovenous shunts.. Cancer Res. 44, 3584-3592. Tian, WN, Braunstein, LD, Pang, J, Stuhlmeier, KM, Xi, QC, Tian, X, and Stanton, RC (1998). Importance of glucose-6-phosphate dehydrogenase activity for cell growth.. J Biol Chem. 273, 10609-10617. Valastyan, S, and Weinberg, RA (2011). Tumor metastasis: molecular insights and evolving paradigms.. Cell. 147, 275-292. Vander Heiden, MG, Cantley, LC, and Thompson, CB (2009). Understanding the Warburg effect: the metabolic requirements of cell proliferation.. Science. 324, 1029-1033. Vander Heiden, MG, Locasale, JW, Swanson, KD, Sharfi, H, Heffron, GJ, Amador-Noguez, D, Christofk, HR, Wagner, G, Rabinowitz, JD, Asara, JM, and Cantley, LC (2010). Evidence for an alternative glycolytic pathway in rapidly proliferating cells.. Science. 329, 1492-1499. Wang, H, Nicolay, BN, Chick, JM, Gao, X, Geng, Y, Ren, H, Gao, H, Yang, G, Williams, JA, Suski, JM, Keibler, MA, Sicinska, E, Gerdemann, U, Haining, WN, Roberts, TM, Polyak, K, Gygi, SP, Dyson, NJ, and Sicinski, P (2017). The metabolic function of cyclin D3-CDK6 kinase in cancer cell survival.. Nature. 546, 426-430. Warburg, O (1956). On the origin of cancer cells.. Science. 123, 309-314. Ward, PS, and Thompson, CB (2012). Metabolic reprogramming: a cancer hallmark even warburg did not anticipate.. Cancer Cell. 21, 297-308. Wong, CW, Lee, A, Shientag, L, Yu, J, Dong, Y, Kao, G, Al-Mehdi, AB, Bernhard, EJ, and Muschel, RJ (2001). Apoptosis: an early event in metastatic inefficiency.. Cancer Res. 61, 333-338. Yi, W, Clark, PM, Mason, DE, Keenan, MC, Hill, C, Goddard, WA, Peters, EC, Driggers, EM, and Hsieh-Wilson, LC (2012). Phosphofructokinase 1 glycosylation regulates cell growth and metabolism.. Science. 337, 975-980. Zhang, J, Wang, J, Xing, H, Li, Q, Zhao, Q, and Li, J (2016). Down-regulation of FBP1 by ZEB1-mediated repression confers to growth and invasion in lung cancer cells.. Mol Cell Biochem. 411, 331-340.